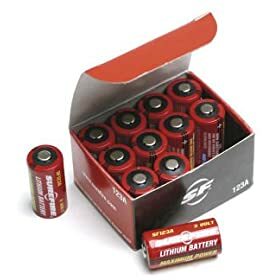 12-Pack Surefire SF12-BB Box of 12 123A 3 Volt Lithium Batteries SF123A. Surefire 12 SureFire 123A Lithium Batteries are Optimized for use in SureFire flashlights, SureFire Lithium batteries pack a lot of power into a small package. * Unlike alkaline batteries SureFire High-Performance Lithium Batteries boast a ten-year shelf life, which means they will be ready when you need them, every time.